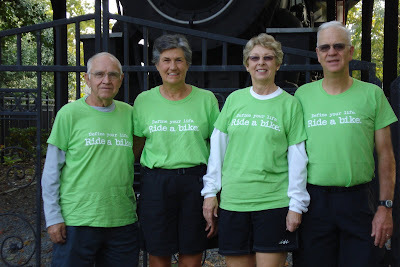 These fine folks were recently spotted "defining your life" and "riding a bike" on the Virginia Creeper Trail. This pic of Garland Osborne (far right) and his riding companions was taken at the trail head. This might be one of the funnest groups I talked to all summer in the shop. They are from Tennessee and travel all over the country to ride different trails. They spent about four days in the Cuyahoga Valley area riding the Towpath and the Cleveland Metro Parks Emerald Necklace Trails. Stopping in to check out the store and ask about the different trails, they had no idea they would leave with a new motto. What impressed me was how they certainly were defining life (and retirement) by riding bikes. Not many trails I could mention they had not been on. I happened to be out at the trailhead the day these folks dropped by (I actually took the photo for them). 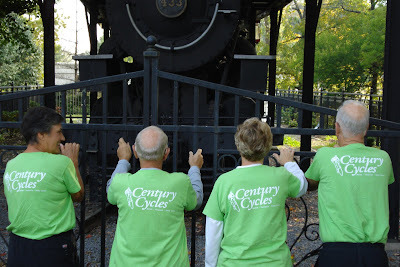 I'm the president of the Virginia Creeper Trail Club and we were so glad their group came by to ride the trail.